Do you tow a travel trailer? The towing hitching up tip we are about to share with you can LITERALLY save lives. Not to mention your travel trailer. 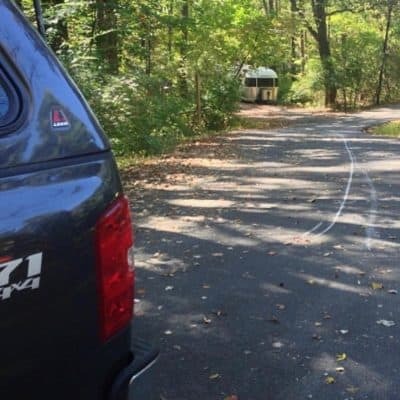 MOST people don't know that this commonly misplaced travel trailer connection could one day cause a horrible accident. Like many others, I'd been doing it 'wrong' for years. It all started while I was just casually scrolling through Instagram. I came upon a friend's photo (below) that gave me serious pause and made me look twice. Something was seriously off. "Wait a minute, is that space between her Airstream wheels and the ground?" Turned out, it most definitely was. Which we all know 'ain't right'. What's wrong with THIS picture? Can you find it? LOL! Yikes, eh? I know this person, and she's no newbie and no dummy. 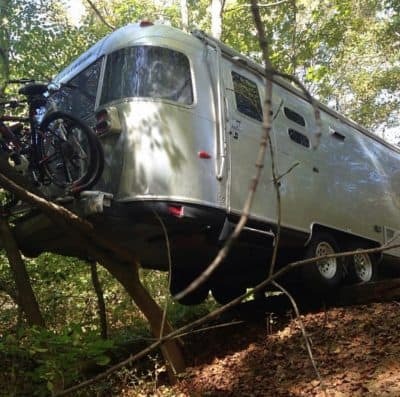 But it was HER Airstream that was dangling off of a cliff. Completely intrugued, I read her Instagram story. When I finished it, a scary thought dawned on me. 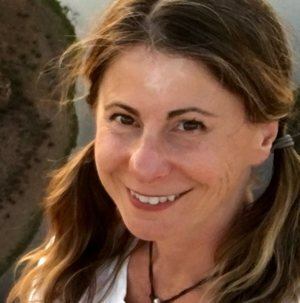 Her Airstream accident could easily happen to SO many other trailer owners out there, myself and Marshall included. Originally, I was thinking that this couldn't happen to me, but when I found out why the trailer didn't stop after disconnecting, I realized it COULD happen to me. I did the same thing she did regarding one particular aspect of hitching up. Therefore, I was guilty as well. Now let's make sure you prevent a runaway trailer from happening to you. That day, Kerri was cruising slowly through a campground (Thank goodness! She could have just as easily been on an interstate). She was going pretty slow when she heard a loud noise. She looked in her rear view mirror. What she saw was so shocking, it must have been hard to even comprehend. The Airstream was rolling backwards, away from the truck. It somehow COMPLETELY disconnected. You can see the pavement markings where the tongue dragged. It was finally and thankfully stopped by a small, VERY appreciated tree that was only about 4 inches in diameter. It came within feet or even inches of tumbling down a small ledge. It stopped with three wheels dangling precariously off of the ground. We are showing you this picture again as it's THAT amazing and scary. Only a couple more inches and bye-bye beautiful Airstream! This is like, a Halloween photo to any RVer. Her Chevy receiver failed. Wait, 'failed' is too tame. It literally broke apart. Terrifying! In case you are wondering, yes her trailer was well within the tongue and the gross weight limits. NOTHING about the hitch failure was Kerri's fault. 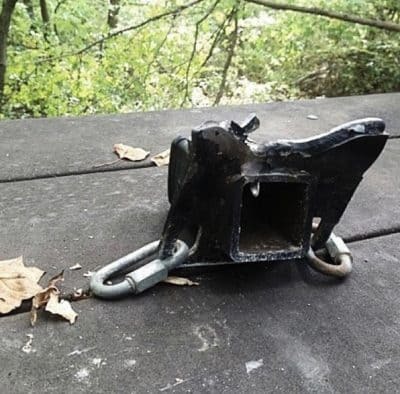 The chain attachment point broke right off. It went with the Airstream. Therefore, the chains went, helplessly, with the trailer and broken-off receiver. And yes, she had her breakaway cable connected to the truck. So why didn't the breakaway cable engage the trailer brakes? We will get to that in a second. First, let's make sure you are familiar with what a breakaway cable does and how it works. Every trailer should come equipped with something called a breakaway cord or cable. This is a quick disconnect cord. One end is connected to a switch on the trailer brakes. The other end gets connected to your tow vehicle. In the event that your trailer comes detached from your tow vehicle, the breakaway pulls a pin out of the trailer, engaging the trailer brakes. This can stop your runaway trailer from crashing into other vehicles, people, or objects. In Kerri's incident, she DID HAVE her breakaway switch connected. So why didn't her trailer brakes kick on? Herein lies the potentially deadly mistake. What is the tip that could have saved Kerri's trailer from getting damaged and from possibly being totaled? Do Not connect your breakaway cable to the receiver!! 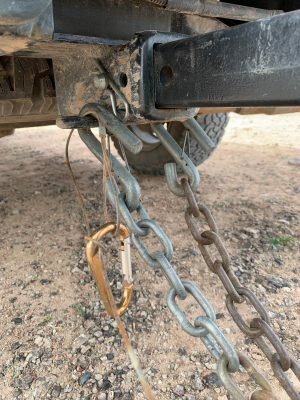 Like most people, you probably connect the cable to the hitch receiver where the chains are attached. INCORRECT place to attach the breakaway cable- to the receiver chain holders. The problem is that what happened to Kerri's receiver rendered the breakaway cable useless. The part of the receiver that she attached her breakaway cable to broke off as well. 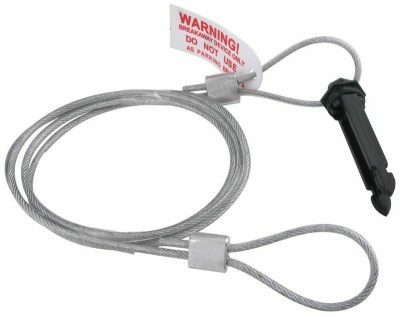 So, DO NOT connect your cable to the hitch receiver or anything associated with the receiver. Instead, connect it directly to the truck somewhere. Kerri thoughtfully added an eye bolt screw that holds on her license plate and now connects it there. You can do that or add your own place to connect the breakaway switch. Some people have it wrapped around their bumper. Others have connected something wide or thick to the end, and shut it in the side of their tailgate. Be aware that it doesn't take much force to pull the pin out. What happened here to Kerri is very unusual. However, it's not unheard of. Failure of the steel could happen to any hitch. Or your bolts connecting the receiver to the tow vehicle could fail or come out. What this means is that if it happens to you, if you connected your breakaway switch to anything on the receiver, you're up a creek with no paddle. Breakaway cable placement is of paramount importance in the event of a catastrophic failure. There are enough things to worry about in life to not include something like this happening to you. It's TOTALLY avoidable, once you know about it. There are some other very serious things to know and to consider when towing. Others, you should be checking quite often. Your trailer should not exceed the towing capacity of your tow vehicle. In fact, you should try not to push the limits of the tow capacity. Trust us, it's way better to have too much power than not enough. Watch your tongue weight. It should not exceed what your hitch can manage and it should not push you over your tow vehicle's GVWR. Also, check your receiver for max tongue weight in the event it is an aftermarket receiver. Periodically check your receiver for tightness where it's bolted to the vehicle's frame. The bolts CAN come loose. I (Camp Addict Kelly) recently found mine to be loose on one side of the receiver of my new truck. Turns out, I had to have a part of it welded to keep it in place (4/11/19). My aftermarket receiver was not installed properly (shocking) and still moved even with the bolts tightened. You need to make SURE your hitch receiver is rated high enough to pull your trailer. If it's an aftermarket receiver, like mine, CHECK IT. A label like this could indicate that yours is an aftermarket receiver. How do you know if it's aftermarket if you are buying a used truck? Well, that's easier said than done. There's not really any reliable visual indicator. If the sticker on the receiver is rated for LESS than the vehicle is rated for, then it's obviously aftermarket. You COULD try to see if you can get the original window sticker. This shows what all the vehicle originally came with. Simply Google search your VIN number. My receiver came with my Ford Raptor when I bought it used. I mistakenly assumed it was factory installed. Instead, it's actually an aftermarket hitch. My receiver sticker. A slap in the face. Only rated for 5,000 Lbs!? Lots of times, it really pays to be light! I had assumed that EVERYTHING about my truck was rated for 8,000 pounds. Not so. Good thing my trailer is only about 4,400 pounds. Yikes, and Grrrr. YES, it's true. You are supposed to cross your travel trailer safety chains. In the event your trailer detaches, they should keep the tongue of your trailer from digging into the pavement. Theory is that the chains will catch the tongue and keep it off the ground (Unless your freaking receiver breaks in half!). If your trailer weighs more than half of what your tow vehicle weighs, you need to have a weight distribution hitch. Oftentimes, it's the law. PLEASE check your tire pressure at LEAST once a month. It really should be checked before each trip. 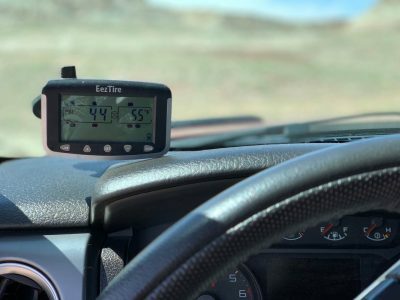 If you have a good tire pressure monitoring system, this can be helpful, but it's still a good idea to manually check. Towing a trailer can be a serious deal. Doing EVERYTHING you can to empower yourself with knowledge about towing will only keep you safer. We think it's best not to connect your breakaway cable ANYWHERE on your receiver. It will become useless if your receiver somehow fails and comes off or apart. Change up your connection point. Find a place that's part of the TRUCK to connect your breakaway. This will at least, in the event of a disconnect, cause your trailer to stop like it's supposed to. Be safe, and Camp On! The only thing i saw is there is no pin, or better yet a lock on the hitch lever as it connects to the ball, i obviously missed one…but one of two is bot too bad, right. You are correct- the pin was missing! We didn’t even initially notice this blunder, oops! We were looking at the more typical issue… they connected the breakaway cable (it looks like) to the receiver. If that receiver comes off or fails and that connection point goes with the trailer, the breakaway won’t engage. Bye bye trailer! Stay safe out there, and thanks for the comment! Absolutely. This is essential! Great information, so thank you! Thanks for the info about the break away switch. 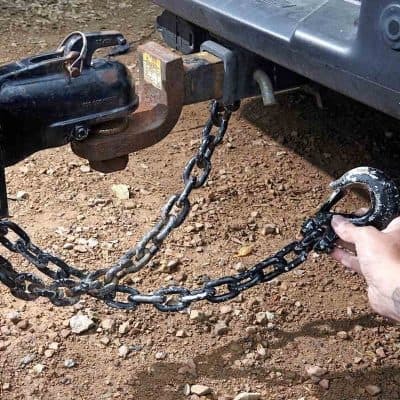 I have added it to my camping list to connect it to the bumper instead of the safety chains which are part of my receiver hitch. You are welcome! Unfortunately, we aren’t surprised to hear you were misinformed by the camper place. Not at all. This is part of the reason we started this website. To have a place where you can go for the CORRECT information! Thank you for the comment and stay safe out there! I have a van but my daughter has a 31’ trailer. Can you change the privacy settings on this post so it can be shared? We don’t have any share settings on this blog post. If you would like to share this with your daughter, simply copy the URL: https://campaddict.com/deadly-towing-mistake/ and send it to her via email or messenger. Or just tell her to go to our website Campaddict.com and scroll down on the homepage where she can see this post. Thank you for reading and we hope this helps her! Wow Thank you Kelly for this excellently written information. Makes me glad I tow a Lil Loafer with a 3/4 ton Chevy!!! However, I noted your watch-out for checking the connection of the receiver to the truck!! I admit to NEVER having considered that! The bigger problem is there is no clevis pin in the hitch release lever in the photo. Well, the ‘award’ for ‘best eyes’ goes to TIM JONES!!!! LOL! Great catch, Tim. We weren’t paying attention to that detail when we got the stock photo from Fastway. We will edit it now to say ‘can you see the TWO things wrong here?’. If this was a contest, you won, Tim. 👏🏼 Thanks for the comment! Thank you for this comprehensive,well written article.I will save and reference it when starting out on my travels with my vintage Streamliner. Adele, Australia. Thank you, Adele, and you’re welcome. Good luck and have fun on your travels! Great article. It’s hard to believe that for 15 years we connected our break-away cable to the hitch. I’m so glad nothing serious ever happened! Thank you for the safety education! This is wonderful information. Thank you for sharing. A topic I often hear mentioned is placing equipment and luggage on a roof rack. It is my understanding that this changes the center of gravity of the vehicle and can be very dangerous. Would you speak to that issue and how to safely stow cargo inside as well as outside of your vehicle? I’m going to assume you are referring to cargo in a car or SUV type of vehicle as opposed to an RV. Our best advice is to follow what the manufacturer says in the vehicle owners manual. If they ‘allow’ cargo to be carried on the roof, they will specify a maximum weight for this cargo and how they recommend you carry it. Also the manual will/should address how to best distribute weight inside the vehicle to that axle weight limits, etc aren’t exceeded. And how to best ensure the cargo is secured. Another maintenance item that’s overlooked is that the breakaway system relies on the small battery attached to it. If this battery dies, then the system will not operate as it needs to engage electric brakes. I was told to change out the battery every two years and to add checking the charge on the connection checklist. Actually the breakaway switch is wired into your trailer’s main 12-volt electrical system. You can confirm this by looking at your rig’s wiring schematic. There is no separate battery (at least in no travel trailer that I’m familiar with) as it would have to be really good sized to provide the power the electric trailer brakes require. It’s just easier to use the system (the RV’s house batteries) that are already there. Cheaper and lighter this way. So if the breakaway pin is pulled, the RV’s house battery supplies power to the trailer brakes (puts them on fully). This causes a major drain on your rig’s batteries, but this is normally the least of your worries if the breakaway switch is called into action. I took a peek at my battery monitor the time I forgot to disconnect my breakaway cable as I was disconnecting my hitch and the switch was activated. It was an impressive electrical draw! Oh, a CARGO trailer- well that’s different. Since we are an RVing site, we are speaking in generalities of travel trailers. We weren’t thinking about cargo trailers. Yes, a cargo trailer would be totally different. Neither of us has ever had a cargo trailer. 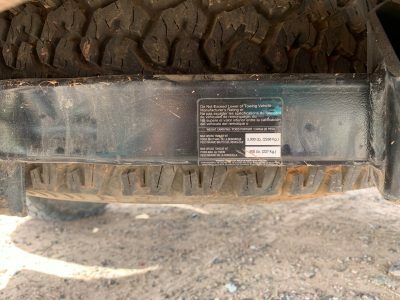 This sounds like something that cargo trailer owners should know about, so thank you for the battery tip for other cargo trailer owners to learn from, and Camp On! Great article except I disagree with weight distribution hitches, they are a bandaid on the problem of too much hitch weight for the vehicle. It causes a lot of stress though the frame (and hitch), increase weight on the front axle and trailer axle possibly overloading each. Proper way is to beef up the rear suspension to carry the weight or get a larger tow vehicle. Glad you liked this blog post. Weight distribution hitches are very legitimate tools to make sure that weight is distributed when towing a trailer. They are a safety device. You can learn more about why weight distribution hitches are important by reading our guide to weight distribution hitches. Not only do weight distribution hitches ‘distribute’ the tongue weight of the trailer to both axles of the tow vehicle, the proper hitch also has anti-sway features. Both anti-sway and weight distribution are two things that a ‘beefed up’ rear suspension and/or a larger tow vehicle cannot do on their own. A properly setup weight distribution hitch does not increase the weight on the front axle. Rather, it ensures that the front axle weight is the same when towing the trailer as it is when you aren’t towing the trailer. 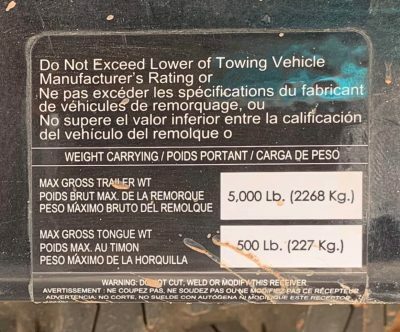 You can confirm this to be true by weighing your trailer with the weight distribution hitch connected and disconnected. Making sure that the weight on the front axle isn’t decreased due to the trailer’s tongue weight is of vital importance to tow vehicle steering and braking. Only a weight distribution hitch ensures front axle weight isn’t affected. Air bags and other rear suspension modifications only handle rear end sag, not front axle weight. Regarding having a larger tow vehicle so you don’t have to worry about a weight distribution hitch – I have a Ram 2500 with the Cummins diesel engine. This truck is rated to bumper tow (as opposed to a gooseneck or fifth wheel hitch tow) up to 17,280 pounds with a maximum tongue weight of 1,800 pounds. My Lance 1995 trailer weighs 5,600 pounds with a tongue weight of around 600 pounds. I think we can all agree that the tow vehicle is more than sufficient for the size of the trailer I have. Some may argue it’s even overkill where a 1500 would be fine. Yet I still use a weight distribution hitch. Why? For anti-sway (get passed by a semi on the freeway while towing if you want to know what I’m talking about) and to ensure that the front axle doesn’t get unloaded. It’s the smart way to tow. Do I think that some people use weight distribution hitches as bandaids so they can ‘get away’ with using too small of a tow vehicle? Absolutely! Just pay attention as you drive around the country and you’ll see plenty of people towing large trailers with small vehicles. Or people that aren’t using a weight distribution hitch and have massive rear end sag on their tow vehicle, unloading the front end. This is why we created Camp Addict – to help educate RVers about RVing products so that they not only enjoy the great outdoors, but do it in a safe manner. Thank you for your comment and Camp On! Marshal, I must respectfully disagree with a few details of your explanation of weight distribution devices. I would contend that you should never use a WDH unless necessary. Something that on one ever talks about is the enormous amount of stress and torque on a tow vehicle; the huge hassle when connecting and disconnecting; the roughly 100 lbs or more of additional weight and the limitations of tow vehicle and trailer articulation. The reality is that any vehicle requiring a WDH is really marginally suited to pull that load anyway. The sway control, as you mention is important on any tow vehicle pulling a trailer with a low aspect ratio. However a WDH should not be used just for that purpose. A stand alone sway bar is a small fraction of the weight and cost and is very effective. It drives me crazy when I see never ending comments and questions that people have regarding tow equipment. Very few people, even RV dealers, mechanics and so called experts truly understand the physics behind weight distribution devices. I see and hear how people are constantly ill advised and misinformed about tow equipment. I’m a firm believer in following manufacturers’ recommendations when it comes to safety. Therefore I turn to those that make tow vehicles to see what they recommend. They build the vehicles and have to certify that they are safe to tow a certain weight. Who else is better at determining what towing equipment to use than the people that build the vehicles? They employ countless structural engineers who know far more than I (and most of those on the Internet) about what stresses a particular vehicle can withstand. Furthermore, for the last decade or so, vehicle manufacturers have been using the SAE J2807 document (PDF) (first issued in 2008) titled “Performance Requirements for Determining Tow-Vehicle Gross Combination Weight Rating and Trailer Weight Rating” as their guidelines to determine trailer weight ratings (TWRs). Since this has become the industry standard, trailer tow ratings are now determined on a level playing ground, whereas in the past manufactures tended to use whatever testing methodology that they wanted to, resulting in some inflated trailer tow ratings. For the purposes of this discussion, I will use Ram and Ford as examples, as these are the vehicles that Kelly and I use to tow our trailers. The Ram Trailer Towing Chart (PDF) recommends weight distribution hitch with trailers weighing above 5,000 pounds. 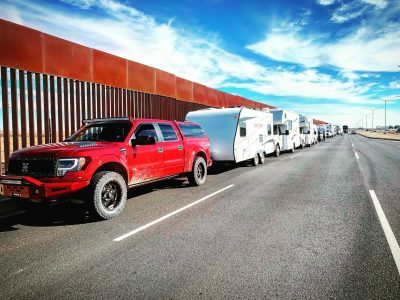 The 2019 Ford Trailer Towing Guide (PDF) has two max trailer capacities for the F-150. When not using a weight distribution hitch (also know as using a weight-carrying hitch), max trailer weight is 5,000 pounds. With the use of a weight distribution hitch, max trailer weight is 13,200 (when properly equipped). 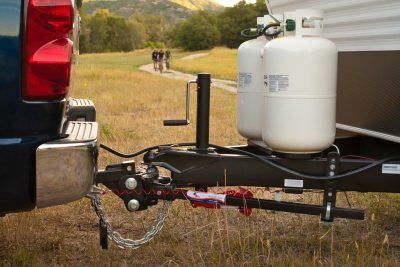 As you can see, both Ram and Ford recommend and/or require the use of a weight distribution hitch (WDH) for trailers with weights above 5,000 pounds. Why the 5,000 pound limit before requiring weight distribution hitch? SAE J2807 has different requirements that must be met above this trailer weight rating and it’s often only possible for manufacturers to meet these requirements by requiring a WDH. The SAE J2807 document states that a specific tow-vehicle may have multiple TWRs (tow weight rating) for weight carrying hitch, weight distributing hitch, fifth wheel hitch and/or gooseneck hitch. This is why you will see different tow ratings for a specific vehicle based upon what type of hitch is used. The SAE document also addresses the structural aspect of things (to ensure that the vehicle’s structure isn’t adversely affected by trailer weights and trailer hitches). There is a section titled “Tow-vehicle Structural Performance” that “defines tow-vehicle structural performance requirements at maximum TWR” for different TWR limits, including use of a weight distributing hitch. Here’s a fun bit of information: Ever wonder why all the manufacturers’ towing videos show off how well they pull max loads up from the Davis Dam (Arizona State Route 68)? It’s because the SAE J2807 document specifically calls out the Davis Dam Grade to be used in the Highway Gradeability Test. Some WDH’s do have limitations (as in it’s recommended to disconnect on rough roads) as you mentioned. However, our top rated WDH, the Andersen Hitch, does not. Plus the Andersen is considerably lighter than other styles of weight distribution hitches, and doesn’t have the spring bars to deal with (which can be a real PITA). I personally have never run into a situation where my weight distribution hitch (a Hensley) has ever got in my way of getting somewhere. And this is saying something since I exclusively boondock and go into some pretty hairy places. You also mentioned using an add-on anti-sway device instead of a WDH to keep sway at bay. Add-on anti-sway devices have their own problems, as we outline here. This includes needing to be disconnected when backing up, and you must disconnect them when road conditions are slick (in other words, when you really need anti-sway). Thank you for you comment, and Camp On! OMGosh our received failed 2 weeks ago. And it looks like we had the same kind. it sheared in half at 5 mph in a Petro truck stop. Oh wow, Mrs824!!! That’s so scary! Did you have damage? Was your breakaway cable still attached to the truck in any way?? Wow. We would love a photo of your broken receiver parts to use in this blog post if you wouldn’t mind sharing! (and more of your story, especially if your breakaway cable was rendered ineffective if it was connected to the receiver) You can email it to us at Newsletter@CampAddict.com if you so choose. We will give you photo credit, of course. No worries if not. Thanks in advance! Wow and yes I want to see pics of his finger! His finger is fine, and the one photo that was taken right after was taken from the least severe looking angle possible. (above) So it doesn’t look THAT bad. But it was pretty nasty looking when it finally got released. No broken bones, no bruising even. Just some lingering nerve damage to the skin. He got away very lucky! Thanks for the words of warning and the great tips, Kelly! You are most welcome, Keri! I can’t believe this is something I have been doing for the entire duration of my RVing life… and it could have gone so wrong. Changing it ASAP! Hope it helps!